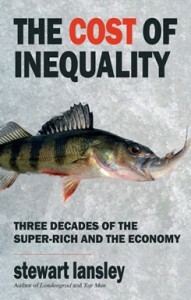 The Cost of Inequality: Three Decades of the Super-Rich and the Economy (Gibson Square, 2011) by Stewart Lansley is an interesting book that seeks to build on recent works, such as Wilkinson and Pickett’s The Spirit Level, by arguing that the case for a more equal distribution of national wealth isn’t just ethical and social but also economic. The grossly unequal distribution of wealth found (especially) in America and Britain has a destabilising effect that undermines profitability and economic growth and destroys industrial dynamism. Lansley begins by rehearsing the increasingly well-known, but none-the-less strikng evidence for growing inequality in the UK and the US. Lansley identifies a “limit to the inequality that is consistent with economic stability and dynamism” and goes on to identify the creation of a two-track economy. In 2011 Forbes counted 1210 billionaires (a record, up 28% since the start of the economic crisis in 2007) with a combined wealth of $4,500 billion (up from $3500 bn). Just over one thousand people command wealth to the value of one third of the entire US economy. In Britain the pay of chief executives of the largest 100 companies rose 55% in just six months at the start of 2010 to an average of £5million per year. In 1997 the City “pool” of bonuses was £1 billion a decade later it had risen to £9 billion, with 4000 people receiving bonuses over £1 million and 20 with bonuses above £10 million. While the rich accelerate away, the rest of the population are being left behind. And the official figures may underestimate the true level of decline for ordinary workers as they include the wages of the elite bankers and financiers whose earnings have rocketed while the rest have stagnated. The decline in wages as a share of GDP is important because, in a mass market economy, the purchasing power of the mass of wage earners is crucial. If wages don’t keep pace with productivity then profits are concentrated with owners and there is a reduced market for goods produced. Both outcomes have damaging effects. Meanwhile the system of rewarding top managers with stock options has encouraged short-term profit taking based on accountancy tricks, asset-stripping and the rapid buying and selling of businesses, all of which has warped the finacial culture. The result of this increased distance and the encouraging of greater risks is greater instabitly. Lansley calls the era of ‘money capitalism” since 1980 as “the age of turbulence” – an era of longer, more extreme recessions that, as inequality continues to rise, may yet result in a disaster even greater than that of 2007. The characteristics of this era are fundamentally different from those experienced in the period of “managed capitalism between 1950 and 1973. Growing inequality and the heavier concentration of wealth, with the accompanying transformation of business and financial cultures are putting the economic system at risk. Lansley identifies four mechanisms by which inequality is threatening our economic security. The first mechanism relates to the shrinking wage base and the decline of the relative incomes of low and middle income households compared to the elite. “This led to the stalling of demand and fuelled the rise in personal debt in a way that greatly increased risk in the financial system.” (157) As wages have declined for these groups, they have sought to preserve their standard of living through debt, which an unregulated banking industry has filled with a variety of increasingly unstable products. Finally as “wealth become more concentrated, so did the distribution of power. From the early 1990s, the finance industry and its lobbyists were able to exercise an increasingly disproportionate degree of influence at the highest levels to ensure weak financial regulation by the state, lower taxes on the wealthy and inaction on tax havens.” (160). For example, in 2010, half of the donations to the Conservative Party came from City donors – a proportion double what it had been in 2005. We live in a political economy that has encouraged the rapid increase in consumer lending to fuel consumption in order to disguise the declining spending power of the mass of the public. These people are struggling to defend their standards of living because there has been a long-term decline in the level of their wages. This demand has created a mountain of debt that has been sustained by increasingly risky financial instruments built with the cash from an elite who have extracted their surplus wealth from profits that were largely generated by squeezing the income of those people who have now become dependent on borrowing. Every link in this horrifyingly circular chain has been created by public policy and deliberate decisions. The new class of the ultra-wealthy frequently claim that they deserve their wealth because they create wealth in the economy. Lansley distinguishes between the “deserving” and “undeserving” rich. But how can this newly entrenched class of “modern day rentiers” who enrich themselves by skimming off the wealth created by others be challenged. Lansley points to four key areas of reform. We need to break up the big concentrations of wealth and income through much tougher policies with regard to personal taxation, tax avoidance and tax havens. “The UK tax system continues to be regressive, taking more proportionately from the poor than the rich… the tax system should be recast until this position is reversed… To prevent high levels of earnings being disguised as a capital gain, such gains should be taxed at the same rate as income with an adjustment to tax windfall gains more heavily than entrepreneurial successes.” Lansley also explores a pattern of minimum taxation at very high levels of incomes that would prevent wide-scale tax avoidance. Lansley’s book is wide ranging – it covers a far wider scope than the three decades suggested in the subtitle – and offers an interesting take on the issue of inequality. The key point, which I think can’t be repeated often enough, is that the reforms that created a fairer and more decent society in the post-war period didn’t have widespread support amongst rich and poor because everyone had succumbed to an overwhelming philanthropy. The lessons of the 1930s was that unregulated, unfettered speculation made possible by the concentration of an overwhelming share of national wealth in the hands of a tiny elite was fundamentally unstable. The welfare state wasn’t part of a plot to destroy capitalism, with was a construct designed to support a market economy that wouldn’t continually tear itself apart. It seems extraordinary that so many of today’s neo-conservatives can’t seem to grasp that their insane worship of unproductive wealth is going to do them, and their class, far more damage in the longer run than accommodation now. They could do with reading and internalising the lessons of Lansley’s book. Or does their self-interest really not extend beyond the end of the noses they have, so firmly, buried in the ‘money capitalist’ trough? Some may look at Lansley’s programme of reform and dismiss it as too ambitious, impossible even, in an era so dominated by rentier wealth. But, of course, Western democracies have achieved a similar reining in of speculators and the “undeserving rich” before in the aftermath of the crisis in the 1930s. The economic disaster of 2007 was almost in the same class as 1929 but it would be a mistake to assume that we are out of the woods. The trends suggest that, rather than the “credit crunch” proving to be a setback to the elite concentration of wealth, it may actually have accelerated the process and there’s certainly no sign that lessons have been learned by those who have been personally enriched. If Lansley is right that high levels of inequality are likely to make capitalism even more unstable then, if we continue down the path we are now on, our societies may soon be facing a crisis that dwarfs what has gone before. This entry was posted in Blogging, Friday Words of Wisdom and tagged economics, friday wisdom, Politics. Bookmark the permalink. Thank you for this article and book review, I found it very clarifying of former macroeconomic policies and their motives and especially appreciated the summary of possible methods of reform. If you write again about rich people, wealth or its mal-distribution, we’d like you to post it to our site. We have a blog page called the Arvie Blog. You can put in links to your site if you like.